Review down below; note there are very mild spoilers about the puzzles. Next on the agenda is Wish, a Christmas vignette. I write this on Halloween. Theming, what theming? Next up is the philosophical fantasy/educational game, The Chinese Room. I should mention this is an at-the-2-hour-judging-mark review, because I get the impression it will be long after the competition is over before I finish. It’s yet another milestone in my quest to find strange IF. It is Camille, our sun! She is bright and happy usually and also shines and stuff. She also hurts my eyes when I look at her directly apparently. She is very nice apart from that though. 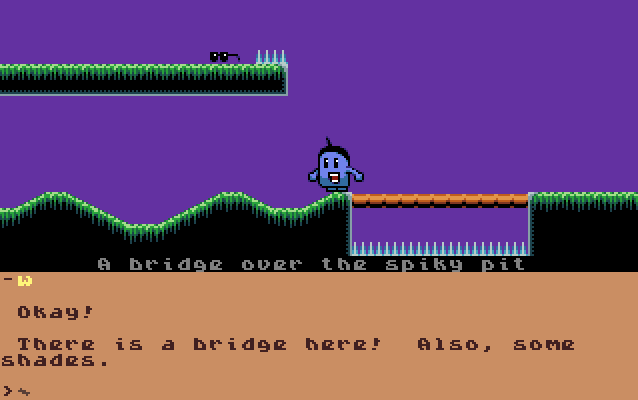 The first ever side-scrolling platformer controlled completely with text commands! So, essentially: graphical IF with a visible character and slow walking speed. However, it’s still worth trying. Enjoy! This is Paul Panks RPG #2 of this competition, written in BASIC. Spoilers for the funny bit about the setting are below, so if you plan to play this you should do so before reading the review. Next on the slate is the post-apocalyptic work Ferrous Ring. (p. 28) Emily Short’s essay “What’s IF?” makes several points of interest, although it does not define interactive fiction well enough to distinguish it from chatterbots and other programs. I’ll grant the essay is digressive. I’d argue it’s simply taking the question of defining IF as the starting point to examine more general issues. In doing this, I developed a theory, which is: good simulation of a complex system often requires several layers of prose. The substrate is that which is pieced together from relatively generic bits; then over that there may be a level of additional customization; and, finally, the Unique Items. Enough variation in the way the prose comes about, and the player may be lulled, if not into thinking that you wrote every variation in advance yourself, at least into ignoring the fact that you didn’t. The nn system (at least in the alpha version) is not concerned about unique prose, but in approach it seems to match the wish outlined above. I believe the greatest potential of nn is as a subsytem of a work made with unique prose. I have no desire to replace for the crafting of unique text, but I do want a way of making the spaces between unique texts more livable. Narrative variation would allow authors to try new tricks, like including 30+ people in a room. This has been attempted before, in The Battle of Walcot Keep. With so many characters moving around, it is highly difficult to keep track of what is going on. If the text was condensed and included narrative variation the descriptions would flow naturally. I could also see narrative variation working with the “object highlighting” system of Nothing More, Nothing Less. (Essentially, the game only describes objects when they become important, giving the impression of a house that is not as barren as your typical work of IF.) Perhaps every object can be modelled, and the narrative variation generator can automatically generate a hierarchy of importance based on the action of the game (so “some appliances” only needs to specify a “blender” when a blender is genuinely needed). (p. 29) Rather than state, as Short does, that “IF *tends* to represent, in some form, an environment or imagined world whose physical space we can explore,” it seems better to say that a simulated world, the IF world, is essential to interactive fiction. The only counterexample Short advanced was Andrew Plotkin’s 1997 The Space Under The Window. This is a word of hypertext implemented in Inform; instead of clicking on a word as would be typical on the Web, typing one of the words displayed causes the appearance of a new lexia, in George Landow’s sense, indicating a section of hypertext. I would like to present an alternative to The Space Under the Window: Astronomy Without a Telescope, by George Jenner. The interactor here is a psychologist who is having a conversation with a patient, forming questions in natural language. Glancing back at my model of interactive fiction types, Astronomy Without a Telescope defines as a “chatterbot”. However, there ends up being both a story and puzzles, so it skirts close to what we tend to call “interactive fiction”.